Moreover, the liberalism of a country’s political system is also but one component of its institutional makeup. Some countries may have strong institutions in other dimensions, such as state capacity, the “degree of control that state agents exercise over persons, activities, and resources within their government’s territorial jurisdiction” (McAdam, Tarrow, and Tilly 2001). So even if we could measure the liberalism of a country’s democracy, would this be the result of poor institutions overall or because of the level of liberalism relative to other institutional dimensions? For example, Pakistan may exhibit lower degrees of liberalism as well as low state capacity, whereas Russia may exhibit low degrees of liberalism even though it has relatively higher state capacity. Which country is then the most illiberal: the one that has neither liberty nor state capacity or the one that fails to provide the former but can provide the latter? In order to distinguish this, we would need rather rich data on a wide variety of institutional components using the same data collection framework. Although it only exists for a short period, the World Justice Project’s Rule of Law Index publishes detailed data of eight different components of a country’s political system: Constraints on Government Powers, Absence of Corruption, Open Government, Fundamental Rights, Order and Security, Regulatory Enforcement, Civil Justice, and Criminal Justice. Several of these components are obvious candidates for Liberty (constraints of government, fundamental rights etc) and state capacity (order and security, regulatory enforcement etc), but in the subcomponents there is also a few that fit either the Liberty and State Capacity concepts. Using the 43 subcomponents in the full WJP questionnaire (available here) I calculate the geometric mean of the answer values (each between 0 and 1) from questions 1.1-1.6, 4.1-4.8, 6.5, 7.1, 7.2, 7.4, 8.4, 8.6, 8.7. These represent questions focused on how free citizens are (constraints on the executive, individual rights to beliefs and privacy, lack of discrimination in legal system etc). As for State Capacity, I calculate the geometric mean of the answer values from the questions 5.1-5.3, 6.1, 6.3, 7.5-7.6, 8.1-8.2. These represent questions that are more related to a state’s capacity (enforcing rules, effectiveness etc). These two variables Liberty and State Capacity tend to have very similar means (0.51 versus 0.56) and standard deviations (0.15 versus 0.13). 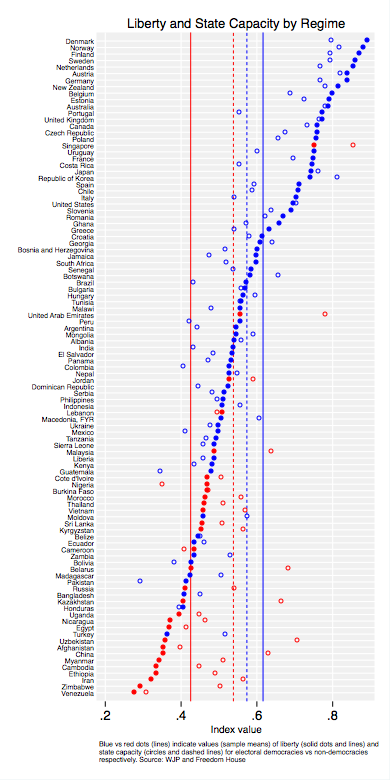 A first – albeit perhaps unsurprising – thing to note is that, between electoral democracies and others, the difference in liberties is on average much larger than the corresponding difference in state capacity (the distance between the solid blue and red lines is larger than that of the dashed blue and red lines). 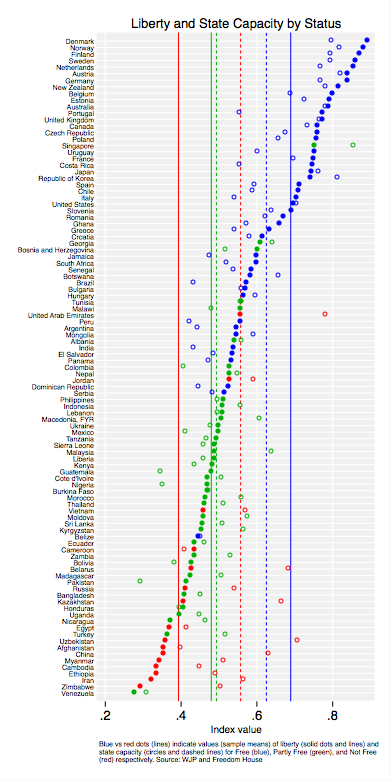 Also as expected, the graph is topped by Nordic and other Western countries, with the three worst countries being Venezuela, Zimbabwe, and Iran. Moreover, in the upper, more liberal parts of the graph, liberty values are often higher than state capacity values, whereas in the lower part of the graph, it is the opposite. If we accept Freedom House’s measure of electoral democracy, the least liberal democracy in the world according to the 2015 WJP data is Turkey. It has a liberty value below even that of the average liberty value among the non-democracies. Along this measure, Turkey is followed by Honduras, Bangladesh, and Pakistan as the most illiberal democracies in the world. A big difference between Turkey and these other three illiberal democracies, however, is that Turkey exhibits much higher levels of state capacity than these others. Interestingly, for all the debate over Victor Orbán creating an illiberal democracy in Hungary, on absolute terms, it still outranks Serbia and is on par with Bulgaria. (I assume this means Juncker will also have to hail Vučić with a “Dictator!” and slap in the face). Among the Partly Free countries, Venezuela ranks as the least liberal regime, with Turkey coming in second, followed by Nicaragua and Uganda. As noted above, we may want to distinguish liberalism from strong overall institutions. For this purpose I calculate the simple country-specific differences between the Liberty and the State Capacity measures, presenting these below along with the electoral democracy category. Whereas the previous could be seen as measuring absolute Liberalism, this difference instead measures liberalism relative to the state’s capacity. Countries with weak state capacity will thus have higher values of relative liberalism, whereas countries with strong state capacity will have lower values of relative liberalism. In this case, the worst performers are somewhat different: Uzbekistan, China, and Kazakhstan, followed by Iran, Belarus, and the UAE. These countries have the largest “Liberty deficit” given its state capacity. Also, in the top there are some changes, with Portugal, Costa Rica, and Italy having the largest “Liberty surplus”. As for democracies, again the worst performing electoral democracy is Turkey, this time followed by Moldova, Macedonia FYR, and Zambia. 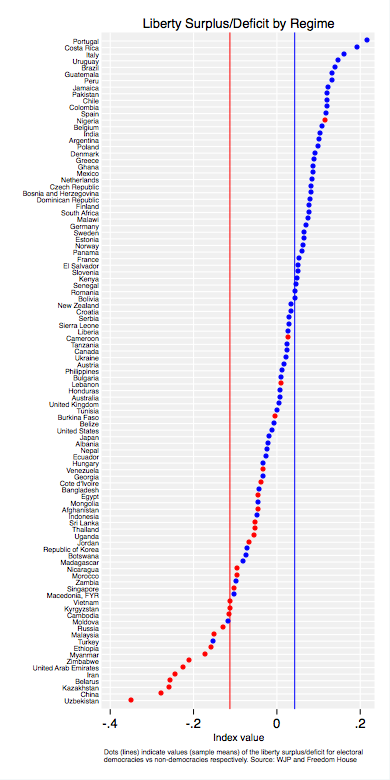 In this relative measure, Hungary performs worse (and is now wedged in between Venezuela and Ecuador) but so are the US, the UK, Australia, and Japan which are all below the democracy average. Coming back to the original question in the title, regardless of whether we calculate a measure of illiberal democracy as an absolute or a relative one, the answer stays the same: according to the latest WJP dataset, the most illiberal democracy in the world is Turkey. One main difference between the WJP-based indices and other, say Freedom House, is that the former does not focus as much on the political competition aspect. Yes, it does have significant information as to the constraints to the executive, but only one single question (1.6) refers to transition of power. As such, as a measure of total democracy, it would be somewhat flawed. But this is neither the focus of the WJP Rule of Law Index, nor of this exercise. The purpose here has instead been to evaluate the liberal component of a country’s institutions for countries of different democratic intensities (electoral democracies, or by Freedom House Status etc). A fuller investigation of liberal democracy would require additional data sources on liberalism versus state capacity, and would preferably also allow investigation over time. One could further alter the definition of what constitutes Liberty and State Capacity using different combinations of questions in the WJP dataset. There’s also room for alternative ways of weighting the different subcomponents (perhaps so that each component gets equal weighting as opposed to each subcomponent getting this). Also, the usual disclaimer applies as to the survey-based nature of the WJP data, whether it relates to the population questionnaires or the expert interviews. Finally, the WJP does not produce data for all countries in the world. As can be seen on its website, large swathes of Africa are not part of the survey, and neither countries like Paraguay in Latin America, and even Switzerland in Europe. Fortunately, democracies tend to be overrepresented in the survey and, for the question under investigation, the limits to inclusion in the WJP sample likely has little bearing on the result.